Over the past decade, social media platforms have completely transformed how billions of people interact with each other. Of the 7.7 billion people on the earth, approximately 3.3 billion have at least one social media account. The average person spends nearly two hours a day on social media apps or web sites. As with any life-changing technology, social media comes with benefits and drawbacks. A systematic review published in the Journal of Medical Internet Research in 2016 takes a careful look at the complex ways that social media is related to anxiety and depression. The researchers collected data from 70 studies. Essentially, they found that the ways in which people engage with social media platforms help to predict and can influence their mental health. The studies demonstrated that, for many people, social media provides social support and connectedness that they would otherwise miss. Essentially, social media allows users to connect with people they may not otherwise come into contact with and express emotions and parts of their identity that may be more difficult to communicate in face-to-face interactions. This can be especially helpful for people with social anxiety, who struggle to interact with others in person. But there are downsides too. Social media platforms may encourage people to compare themselves to others. Even with today’s array of emojis—it can be more difficult to express complex feelings and emotions with social media. As a result, miscommunication is more common than in face-to-face interactions. Some people may use social media to replace in-person interactions, which can lead to lower quality social connections. Not surprisingly, research demonstrates that how people use language and express themselves on social media provides clues about their mental health status. People who post positive messages and have high-quality interactions are less likely to suffer from anxiety or depression compared to people who did not use social media or have more negative interactions on these platforms. Research has identified some specific behaviors that contribute to or detract from overall mental health. One study found that people who interact with former romantic partners on social media are more likely to experience anxiety or depression compared to those who do not. Another study found that when people with serious depression used Facebook over a three-month period, they experienced fewer symptoms compared to similar participants who did not use Facebook. In addition, when study participants became “friends” with their psychiatrist, they showed significantly faster improvement in their symptoms. Studies found the tendency to compare oneself to others on social media—whether you see yourself in a more positive or more negative light—is a significant risk factor for depression and anxiety. In addition, people with depression were more likely to rate themselves as being inferior to others on social media compared to those without depression. 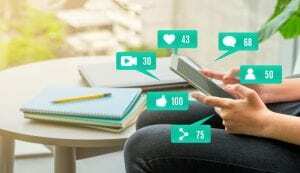 “Social media extends what humans tend to do in everyday life anyway, such as connect with friends, look for inspiration, and seek support,” explained Janis Whitlock, a research scientist at the Bronfenbrenner Center for Translational Research who studies the development of early detection and intervention in mental health and well-being using social media. The take-home message: Social media affects people’s mental health in complex ways. Understanding the content and quality of online interactions can help to identify people with anxiety and depression. And using social media in a positive way can help alleviate mental health symptoms while using it in a negative way is associated with more mental health symptoms.